This short section of the Canyon Rim Trail at the Roaring Plains Wilderness in Randolph County, West Virginia is an easy 0.6 mile out-and-back trail that leads to a campsite with amazing views of mountains from the Allegheny Front. This part of the Roaring Plains Wilderness is fairly far in, so expect a much longer hike just to reach the trailhead, but the views are well worth the effort. Shortly after entering the trail, you'll pass a campsite that sits just off the trail and just after that is a small trickling creek that you can use to filter water. Further on, you'll hike through an open field which is full of tall grass and wildflowers which reach about 4 feet tall - the trail here can be a bit more difficult to follow, but for the most part you can see where it cuts through the grass. Just after hiking through the open field you'll find a trail on your left - take this trail to find a nice campsite that can hold at least one tent and a hammock, if not two small tents. Behind the campsite sits a cliff about 40 feet tall, or more, with sweeping views of West Virginia's mountains, Seneca Rocks (on a clear day), and even the Roaring Plains pipeline lookout point. The Canyon Rim Trail continues on from this campsite; however, it becomes a complete bushwhack not too far after the campsite. It technically runs along the edge of the Allegheny Front until it reaches the lookout point along the Roaring Plains Trail. Trailhead: This trailhead can be found along the pipeline in the Roaring Plains Wilderness, close to the end of the Hidden Passage to Pipeline Lookouts Trail. You'll also need to hike in on the South Prong Trail to reach the Hidden Passage Trail, so expect to hike in about 4.5 miles one-way to reach this trailhead. The easiest way to find this trail is to start tracking your location on a GPS device from the trailhead for the Hidden Passage Trail and hike down the pipeline until you hit 2.1 miles on your device - the trailhead can be found on the right-hand side of the pipeline, but there are no trailhead markers or signs. Alternatively, if you hike without tracking, you can find the trail by checking the right-hand side of the trail about a 1/4 mile in after heading down the pipeline. Water Source: As stated above, there's a small creek that cuts through this trail about half way into the 0.3 mile one-way hike in. This creek can be used to filter water for drinking. Lookout Point: The lookout point sits just behind the campsite, where this GPS data ends. Please beware that the lookout sits on a cliff about 40+ feet tall, so watch your footing. Parking: Parking can be found at the eastern trailhead for the South Prong Trail. 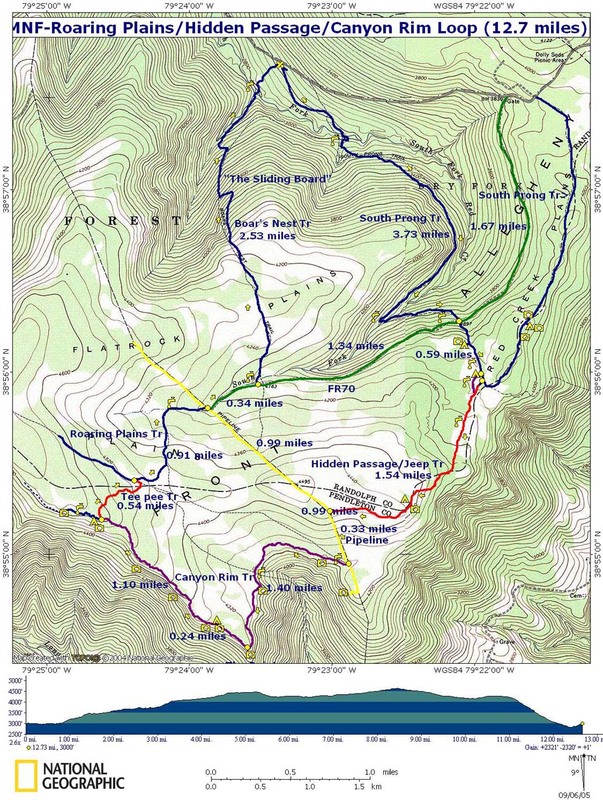 Be sure to checkout MidAtlanticHikes Roaring Plains trail map PDF.